We already know that robots can be smarter than us as evidenced by Watson beating [Ken Jennings] at Jeopardy, or Deep Blue beating [Garry Kasparov] at chess. Now [E024576] is striving to build a bot to compete at physical games. For the challenge, he’s chosen one of the games from a television game show called Minute to Win It. This challenge is called Mad Dog, and lends its name to this robot. The goal is to pick up a ruler with two tic tac containers glued to it, then shake it until all of the candies are ejected from those containers. Check out what he’s come up with in the clip after the break. 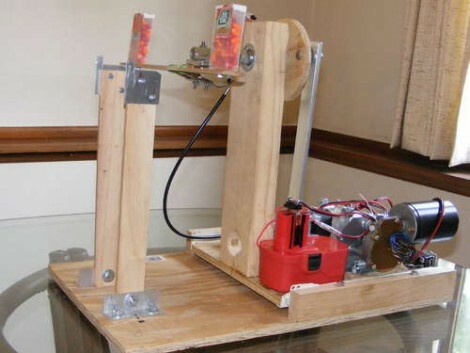 The machine is driven by a PIXAXE microcontroller, with input from an IR remote control. It reaches out, grips the ruler tightly, and shakes like there’s no tomorrow. Quite impressive, even if there’s very little purpose in its operation. That makes it the perfect task for robot, right? Utterly pointless and a complete waste of time, money and resources – perfect! Are those cinnamon tic-tacs? I think I got a couple of those packs somewhere, wonder what the expiry date on them is. This article is nice, but there is a big blunder in this article i.e you say that “robot can be smarter than us” i want to tell you robot is human made thing so how can robot is smarter we make robot not robot make us. I hope you understand. Utterly pointless, except to show all manner of motion control with easy to get inexpensive bits and pieces. Good video and explanations, too. I love it.